The legal weed industry has broken in its new shoes and is now swaggering confidently across states along the west coast and nearby regions. Even as cannabis culture hits the mainstream, there are many things the average reader and cannabis consumer might not know about recreational marijuana jobs. 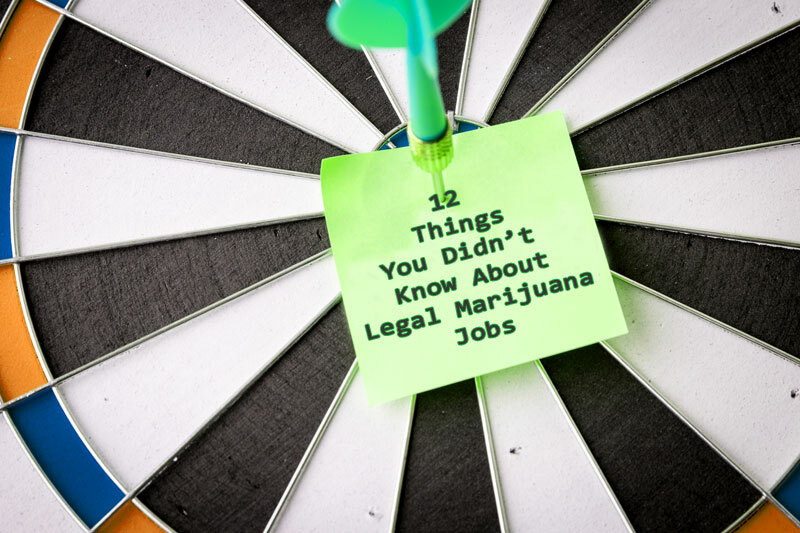 Some surprising, others confusing, here are 12 things you didn’t know about legal marijuana jobs. 12 Things You Didn’t Know About Legal Marijuana Jobs: Where Do We Begin? The weed industry has been shrouded in mystery from its inception and has obtained some curious qualities even as the industry has moved out from under the black market to the microscope of the retail and tourism industries. The following represent only a sample of the many details that make up the complicated structure of the industry as it stands today. Despite having been a prevalent headline throughout the legalization of cannabis in numerous states, many individuals are surprised to hear that liquor boards often regulate the sale of recreational cannabis. Other than both being controlled substances, cannabis and liquor sales have surprisingly little in common. This has made for a rocky start that has largely flown under the radar concerning liquor boards’ lack of experience dealing with the weed industry. As more states pass recreational measures allowing cannabis distribution, liquor boards will continue to feel around in the dark until they eventually find a light switch. Preparing to break into the cannabusiness? Keep in mind that most businesses require applicants to undergo a thorough background check to ensure their eligibility for the position. Despite its illicit roots, the legal weed industry is shockingly strict. Internal and external theft is always a fear for business owners, as well as confusing mandates from the state which require utmost care and attention to detail. If you are hoping to work in the recreational cannabis market, you should accept right now that a background check is probably in your future. Each business has some discretion when deciding what makes an applicant ineligible for the job, but some workers are angry that marks on their record may disqualify them from working specific positions. Another thing you perhaps didn’t know about legal marijuana jobs is that recreational customers cannot buy from medical shops. This varies from state to state, but in Oregon recreational customers are not allowed to purchase products from medical dispensaries. Because of this, medical dispensaries in major cities like Portland have lost a significant customer base and are struggling to make ends meet. This quandary puts medical customers at a disadvantage since dispensary owners are now beginning to abandon their medical shops to reapply for recreational licenses. Some fear losing their business completely due to recreational focus on sales. Something else you didn’t know about marijuana jobs is that growers can’t refer to their plants as organic. Due to some stubbornness on behalf of various government agencies, cannabis cannot technically be labeled as organic as deemed by the FDA. Even if the plants were grown in organic conditions, cannabis’ Schedule 1 denomination disqualifies it from being considered a healthy or beneficial substance. If you are worried that the weed you purchased from your local dispensary might be laden with chemicals, fear not. Most dispensaries feature products which have undergone all the necessary vetting procedures and tests to ensure a safe-to-consume product. While plants may not technically be labeled as organic, most cultivators hold themselves to a high level of accountability, keeping the natural integrity of the plant. I don’t know how many budtender job postings I’ve bookmarked and compiled that each received hundreds of applications. In case you didn’t know this about marijuana jobs, competition is fierce. Especially in the sales and growing sectors, competition can be extremely overwhelming for hiring managers tasked with leafing through hundreds of resumes. Whereas other customer service jobs in cafes or bars may be less strict concerning qualifications, dispensary hiring managers often expect past budtending experience from candidates before considering setting up an interview. Some dispensaries however do consider less qualified, but equally motivated individuals. To get your foot in the door, it’s all about sending out multiple applications and making connections with members of the industry. The lazy stoner stereotype is a tired phrase in its own rite and is consistently being subverted as more professional stoners blaze trails in the industry. As it turns out, the cannabusiness is one of the best industries for young entrepreneurs, especially those with college degrees. Uber-popular cannabis concentrates or “dabs” require skilled lab workers who have the skillset to extract cannabinoids from plant matter using dangerous industrial solvents, heat and pressure, ensuring a satisfactory final product. The same goes for jobs making edibles or running a retail business. In general, the legal industry is made up of a diverse demographic of different backgrounds and education levels. For those who do not have a college degree, the weed biz will still welcome you with open arms in jobs as a grower, writer, developer and more. We touched on this briefly in #2 and will reiterate it again here – the cannabusiness is a professional industry that leaves surprisingly little room for levity. Not that workers don’t enjoy their jobs, but compliance measures make the path difficult to navigate a lot of the time. As such, there is no on-site consumption of cannabis allowed in or outside of dispensaries. Furthermore, most retail businesses are forced to operate using cash based sales – a clumsy, dangerous method. This originates from fear on behalf of big banks considering investing in the weed industry. While the federal government does not say outright that banks can’t work with dispensaries, there is a laundry list of qualifiers that discourage banks from allowing dispensaries to set up accounts. If you live somewhere where cannabusinesses advertise, you may have noticed a shift in the marketing approach of the industry as a whole. Rather than advertising to small target groups, the industry has expanded its net to include as many consumers as possible – and why not? Visit any dispensary in a major metropolitan area and you will see everyone from the grandma from two doors down to the college professor and the stay at home dad. One of the primary ways the industry has been rebranded is by changing the name from “marijuana” to cannabis. The explanation for this shift is rooted in some unsavory history between American colonists and Mexican revolutionaries. In general, the word “marijuana” has more of a drug connotation, whereas “cannabis” (the plant’s actual name) retains more of a medical, holistic feel. Now that the American cannabis industry has left much of its illicit past behind, it has adopted many of the characteristics of other businesses boasting a long supply chain. In short, you can make anywhere from minimum wage to high six figures and above working in the cannabusiness. Budtender wages start as low as about $10/hr, averaging around $12 plus tips (if allowed). Managers and lead budtenders can make closer to $15 before tips, but this occurs less frequently. At the same time, upper level commercial cultivators, business owners and technicians can work six figure marijuana jobs with the right qualifications and years of professional experience. When working at a cannabis dispensary or similarly regulated sector of the supply chain, you are not allowed to consume cannabis while working. Although many budtenders cop to smoking right before work, being caught consuming while working is enough to get you fired and have a lawsuit slapped against the dispensary. This is why dispensary hiring managers are always looking for equally passionate and professional applicants. This extends to the field of edibles creation as well. Bakers and edibles chefs are tasked with making tasty creations, but aren’t allowed to consume their recipes as it is a violation of code. therefore, the cook must go off skill, intuition and recipe alone. While you can’t often get high at work, most dispensary workers are awarded a significant discount on weed products which saves them a hefty haul of cash in the long run. Not bad for one of the more entry level marijuana jobs. Like every industry, the cannabusinesses wages a certain amount of drama and scandal in its headlines, but it’s not for lack of community. The industry is actually very tight in most instances. Since the business is essentially entering its second puberty (insert Mitski here), there are a lot of complexities that still need to be ironed out. With that said, members of the professional cannabis community are, on the whole, an empathetic, intelligent and dedicated bunch. In general, the stoners look out for each other and do their best to inform without being condescending. Working in this business can encourage lifelong friendships and business partnerships unlike those in any other industry. Political developments within the last year have indeed sidetracked various areas of cannabusiness progression, but overall, the state-run industries are going strong. With the industry set to keep raking in the billions in the years to come, it is likely that the current administration will make very little action against the statewide laws already in place. Now that there is greater political support of cannabis alongside destigmatization by the general population, there has never been a better time to pursue a job in the industry. As CBD is recognized for its incredible medical potential and synergy when used with THC, weed is having another breakthrough in the scientific and medical communities that will sustain a long-lasting impact.